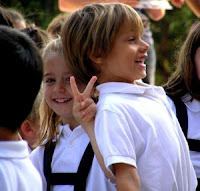 School BMI screening and childhood obesity legislation is becoming a growing concern among parents. This update is in response to multiple readers’ requests. This may be news to parents, but did you know that “most parents agree schools are the appropriate place to have their child’s weight screened” and that most of you support your child’s BMI being measured by school personnel? 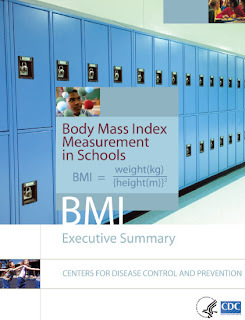 These are among the claims in a recent policy brief called “Body Mass Index Measurement in Schools,” from the Centers for Disease Control and Prevention. This is what your lawmakers are hearing. Its authors, led by Allison Nihiser, MPH, of the Division of Adolescent and School, said the paper was “to inform decision making on implementing BMI measurement programs,” as the Institute of Medicine, commissioned and financed by the Robert Wood Johnson Foundation, had called upon the federal government to do in 2005. The full Nihiser paper, published in the Journal of School Health, summarized the recommendations of an Expert Committee of stakeholders it had convened in 2005 — that’s the group that developed the new guidelines for the medical management of fat children. According to these experts, the goals of BMI screening programs in schools include the prevention and reduction of obesity; helping parents correctly identify their children's weight status; motivating parents and their children to eat healthy, be physically active and manage weight; and prompting parents to take their 'overweight' children to doctors for medical follow-up. The Nihiser paper experts recommend that communications with parents “should focus on the health implications of obesity, overweight and underweight and make it clear that the school will be measuring weight out of concern for a student’s health.” Letters with BMI results sent to all parents should “strongly encourage parents to consult a medical care provider to determine if the student’s weight presents a health risk” and give healthy eating tips, including fruits and vegetables, whole-grains and fat-free or low-fat dairy products; and make parents aware that youth should engage in at least one hour of physical activity a day. It states that parents who get their child’s BMIs results along with tips for healthy living are more likely to initiate medical care, dieting and exercise as part of a weight-control plan for their children, than those parents who aren’t given BMIs and helped to identify their child’s weight status. It’s unlikely that lawmakers have looked up the studies mentioned in the Nihiser 21-page policy paper to learn what the evidence actually shows. A careful read of the paper also reveals that the recommendations of this Expert Committee and the IOM admittedly have no supportive evidence. BMI screening recommendations even contradict the conclusions of the U.S. Preventive Service Task Force, which recently released its findings after a major review of nearly 40 years of evidence on screening and interventions for childhood and adolescent “overweight” — some 6,900 studies and abstracts. Unbeknownst to most lawmakers, the USPSTF expert Childhood Obesity Working Group had even gone so far as to publish an unprecedented article criticizing the American Academy of Pediatrics and American Academy of Family Physicians for endorsing BMI screening of children and for their use of BMI growth curves. BMI not a health measure. BMI was never meant to be a diagnostic tool, and children with BMIs over these arbitrary cut-offs on growth curves do not necessarily have clinical complications or health risks, according to CDC health scientists. After its comprehensive review of the evidence, the U.S. Preventive Services Task Force (USPSTF) concluded that there is no quality evidence to support that childhood “overweight” or “obesity” is related to health outcomes. The evidence shows that BMI fails to predict fitness, blood pressure, body composition or health risk. Even a recent 50-year prospective study found no association between children’s BMI and heart disease later in life, and other research has found weight to be unrelated to children’s risks for insulin resistance. No childhood obesity intervention is supported by evidence. The USPSTF concluded that no scientific review has been able to find any quality evidence that any programs to reduce or prevent childhood obesity — no matter how well-intentioned, comprehensive, restrictive, intensive, long in duration, and tackling diet and activity in every possible way — have been effective, especially in any beneficial, sustained way; nor have they been able to demonstrate improved health outcomes or physiological measures, such as blood lipids (“cholesterol”), glucose tolerance, blood pressure or physical fitness. Nor has any diet or exercise interventions in children been shown to lead to better health outcomes in adulthood. Healthy eating programs to prevent obesity or disease focused on increased fruits and vegetables , or on diets low in fats, sugars or calories for children are not supported. Nutrition-related health problems come from deficiencies brought on by dietary restrictions, overemphasizing certain foods to the exclusion of others, and undereating, not from enjoying all foods and normal eating. And, as has been extensively covered here, childhood obesity is not the result of food or activity. Not only has the USPSTF found no evidence to support the effectiveness of counseling for healthy eating in young people, but it has found no evidence to support low-fat diets in children. But it did find growing evidence for harm, including growth retardation and nutritional dwarfing, nutrient intake, laboratory safety parameters, or other adverse effects. A comprehensive examination of the evidence surrounding dietary fats for children by researchers for the American Society for Nutritional Sciences and other international child development experts concluded that the focus on fat and the nutritional messages to limit any “bad” foods are unhelpful and actual causing harm. The largest and most comprehensive state childhood obesity program was launched in Arkansas in 2003. As reviewed, this unprecedented effort put every possible resource into the project and included every intervention popularly believed necessary to combat childhood obesity, including BMI screening. However, it has failed to demonstrate any positive effect on children’s health or weights and, instead, suggests the very potential harms cautioned by the USPSTF childhood obesity experts. In contrast to the claims by government officials of the popularity of BMI screening of children and sending notes home to parents, Arkansas had to scale back its BMI program last year because of parent complaints. Parental objections are being heard around the country as they increasingly realize that they can actively opt out and not have their children participate in BMI screening. With the heavy promotion and popular acceptance of the myths of obesity as due to poor diets and sedentary behaviors, and the magical abilities of certain foods to prevent chronic diseases that far exceed the evidence, legislators hear fewer complaints about the ‘health’ curriculums being taught to children which are integral to BMI programs. In Healthy People 2010, where the government Department of Health and Human Services outlined it goals for the nation, stated that school health education should teach students the negative consequences of unhealthy diets and inadequate physical activity, and teach them how to control obesity. Because the basic idea of sound nutrition seems reasonable and unobjectionable, few parents realize how much unsound and potentially harmful health and nutritional information is being taught children, as well as being age inappropriate for their developmental readiness, such as the through the “Healthy Schools Program” funded in part by $8 million from RWJF. Yet, according to RWJF, 48 states and D.C. have mandated school health education requirements to address childhood obesity and 17 states have mandated school meal restrictions that exceed nutrition standards of the U.S. Department of Agriculture attempting to address obesity. 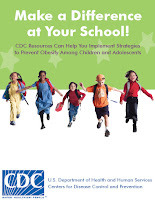 To encourage their adoption, the CDC offers grants to states that develop school health programs designed to discourage ‘unhealthy’ eating and sedentary behaviors in young people “that increase risk for obesity and chronic disease.” These Division of Adolescent and School Health (DASH) grants are awarded for states that have school-based programs for physical activity and healthy eating, health education, school employee wellness, counseling, psychological and social services and a healthy school environment. DASH grant recipients must also include state documentation of “critical health behaviors that contribute to obesity and overweight in youth,” assessment of school programs, and effective partnerships between government and NGOs in support of school anti-obesity health programs and policies. The CDC also funds seven NGOs through DASH grants, as well as supports 23 national NGOs to provide capacity-building assistance for preventing chronic disease and other services for high-risk youths. To convince the public and parents of a crisis of childhood obesity warranting these expansive programs, as well as to fulfill the documentation and assessment of them for these grants, BMI surveillance is promoted to identify student populations to target. According to the CDC, 23 states succeeded in receiving DASH grants in 2006, with an average award of $416,000: Arkansas, California, Colorado, Florida, Hawaii, Indiana, Kansas, Kentucky, Maine, Massachusetts, Michigan, New York, North Carolina, North Dakota, Oregon, Rhode Island, South Carolina, South Dakota, Tennessee, Vermont, Washington, West Virginia and Wisconsin. So, parents trying to protect their children from weight and food concerns and the obesity hysteria are up against, not only unscientific myths and popular stereotypes, but a vast array of government and privately funded special interests all using obesity to promote their programs and products for healthy eating, exercise and lifestyles. More than 300 state and national organizations, agencies and nonprofits groups are part of the National Alliance for Nutrition and Activity (NANA), alone, funded by the CDC to the tune of $65 million this year, with $5 million just for their fruit and vegetable programs. The CDC budget for these healthy eating and activity initiatives has grown 2,000 percent just since 1999, making a lot of careers, agency budgets, and reputations dependent on keeping at the forefront a crisis of obesity and urgent need for governmental healthy eating and lifestyle interventions, despite the lack of evidence. As a result of organized efforts by Robert Wood Johnson Foundation and public-private partnerships, childhood obesity and BMI surveillance and screening legislation is steadily being introduced in states across the country. According to a October 3, 2005 Legislative Overview from the Health Policy Tracking Service, using reports from RWJF, to address childhood obesity, already 200 bills had been introduced in 42 states to impose nutritional regulations, 44 states had introduced legislation on physical activity standards, and 24 states had introduced legislation to teach children about proper eating and exercise as part of health curriculums. The Nihiser report states that 22.4% of states and 41.3% of school districts now require BMI measurements on students, with most requiring reports to parents. Georgia became the latest state on Friday, when its Senate approved the Student Health and Physical Education (SHAPE) Act, which requires schools to conduct physical fitness testing of children and spells out the conditions which will designate schools as “unhealthy schools.” And last Monday, legislation H.F. No. 3390 was introduced in the Minnesota legislature which would establish a BMI monitoring program “to measure progress in reducing the percentage of overweight and obese children” to target its obesity programs; to convene an advisory council to establish statewide curriculums for “health, nutrition and physical education” to promote healthy lifestyle habits and reduce consumption of refined sugars, saturated fats, and processed foods;” and look to use locally grown products in school food programs.